This website is a virtual tour of the machines that are (or once were) in my collection. Some of these were donated, others I purchased. A reference section provides access to 465 paper tapes and 853 drawings. In this museum, you'll see not only the exhibits of the machines, but also articles about their restoration (PDP-8/I, PDP-8/L, PDP-8/M, and PDP-12), including, of course, lots of pictures. Where possible, I've added the history of the machines and what they were used for (for example, a PDP-8/E used for LORAN-C Navigation, and a PDP-8/M used for real-estate office management). If you're on LinkedIn, then click here and join the "PDP Minicomputer Collectors Group"! In this picture, you can see the vast majority of the collection. 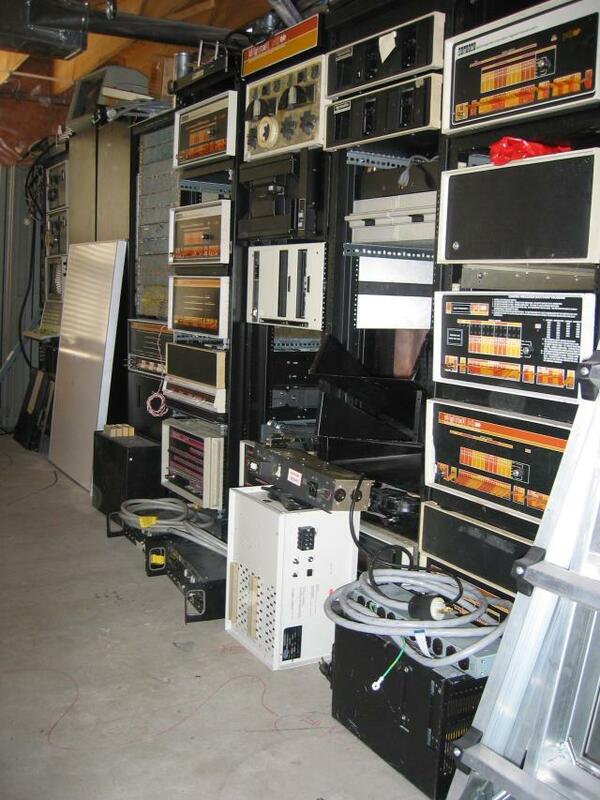 Starting from the far left, we have the PDP-12, followed by two cabinets (with a whiteboard in front of them) featuring MM8IAs, FPP12, DW08s, DM01s, PT08s, a TC58, a BA12, and CC02s. In the next cabinet is a store of backplanes and a PDP-8/I. The next one features two PDP-8/Ms, a PDP-8/L, a PDP-11/10, and a PDP-11/R20. The next cabinet has a TU56 tape drive, a PC02 (PDP-9) punch, a dual floppy, and a PDP-11/20 on the bottom. Then there are two TU60s, another dual floppy, and, hidden behind the UPS, an RK05. Finally, the last cabinet contains a PDP-8/F, some kind of PDP-11 expansion cabinet, and three PDP-8/Es (not all visible). This museum is called PDP12.ORG in honour of the largest machine in the collection, the PDP-12. I started collecting things at an early age. I was probably around 12 years old when I dragged home some "junk" that I managed to find at a local repair depot. This was the golden age of junk (mid 1970's) -- very few companies recycled their products. Most companies had their own repair personnel who were equiped with oscilloscopes, soldering irons, and other tools of the trade, and would repair their own products. Some time later, a used/surplus electronics store, called "Century Twenty One" (not to be confused with the real-estate company, "Century 21") moved into the same strip mall. I eventually got a job there, and was responsible for inventorying their equipment, performing repairs on whatever was salvageable, and hauling some of it home. The stream of junk became even more "never ending". It's here that I purchased my first PDP-8/I with 4k of core memory for $350 of my own, hard-earned money (hey, at $4.50 per hour, that was a lot of money back then!). Over the years, I saw all kinds of machines go through that place, from obscure "desk-computers" (where the whole desk was some kind of minicomputer), right through a good range of the DEC minicomputers (PDP-8, PDP-8/S, tons of PDP-8/Is, a few PDP-9s, and then some PDP-11s towards the end). The PDP-8/I was the first computer I ever programmed -- it was so simple. There was a nice front panel that allowed you to enter data into memory, and with the flick of a switch, you could run your program and see the lights flash. I was hooked! I collect most things that are visually "neat" -- that's why I have not only DEC minicomputers, but also some Nixie-Tube-based test equipment, and calculators.